We won second prize out of twelve teams at the Computer Vision Competition at the 27th IEA-AIE conference in Kaohsiung, Taiwan. The competition task was counting people passing through various shopping mall entrances in different situations and angles, with or without shadows. 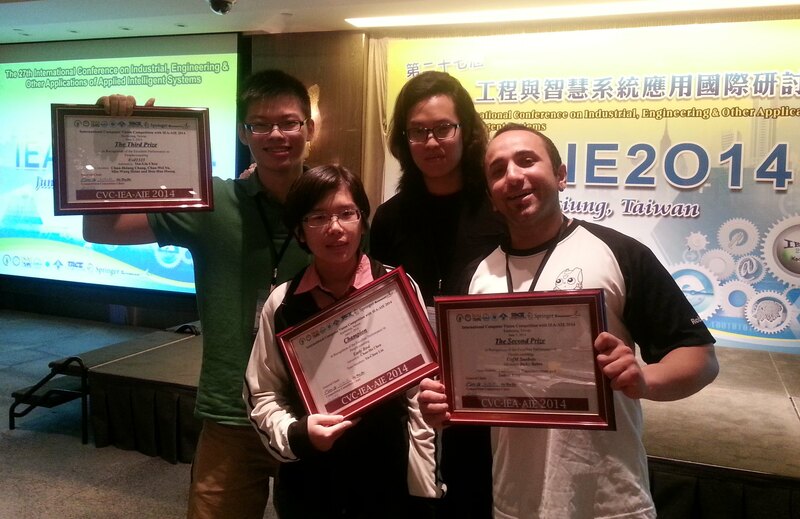 Congratulations to Amirhossein Hosseinmemar and Joshua Jung, the two students who did the work for this competition. There is also a gallery of pictures from the competition. Congratulations to Meng Cheng Lau, who successfully defended his Ph.D. thesis, Betty: A Portrait Drawing Humanoid Robot Using Torque Feedback and Image-based Visual Servoing. This work involves upper-body coordination, hand-eye coordination, and workspace management for humanoid robots, and uses a drawing domain to evaluate the work. Videos of this work are available on MC's YouTube Channel, and the thesis itself is available in the 2014 publications section of this website. Our FIRA HuroCup robotics competition team - the SnoBots - has won the kid-size division of the 2013 HuroCup in Kuala Lumpur, Malaysia. FIRA is the oldest robotics competition in the world, and the HuroCup is one of the most challenging competitions in existence: a single humanoid robot must compete in an octathalon that consists of a sprint, marathon, lift-and-carry, obstacle run, weight lifting, basketball free-throws, soccer penalty kicks, and a climbing wall. These collectively challenge a robotics team in a broad range of skills central to humanoid motion, complex motion planning, and human-robot interaction. Our team came in first place in climbing, first place in weightlifting, second in United Soccer (where the robot must join with other competitors to form a soccer team), fourth in sprinting, and fifth in soccer penalty kicks. Based on the score across all events, the team won the highly-coveted all around event: the King's class at HuroCup. The students traveling to Kuala Lumpur were Chris Iverach-Brereton and Josh Jung, and the faculty involved with the team are the directors of the Autonomous Agents Lab, Jacky Baltes (who also travelled to Kuala Lumpur) and John Anderson. The team also relies on a range of people who spent time coding over the course of the year, including Diana Carrier, Tiago Martins Araujo, Geoff Nagy, Meng Cheng Lau, and Andrew Winton. Congratulations to everyone and thank you for the hard work! Update: We put together a youtube playlist of videos from the competition and preparations. There is also a collection of videos hosted locally in the videos section and a gallery of images from the trip. 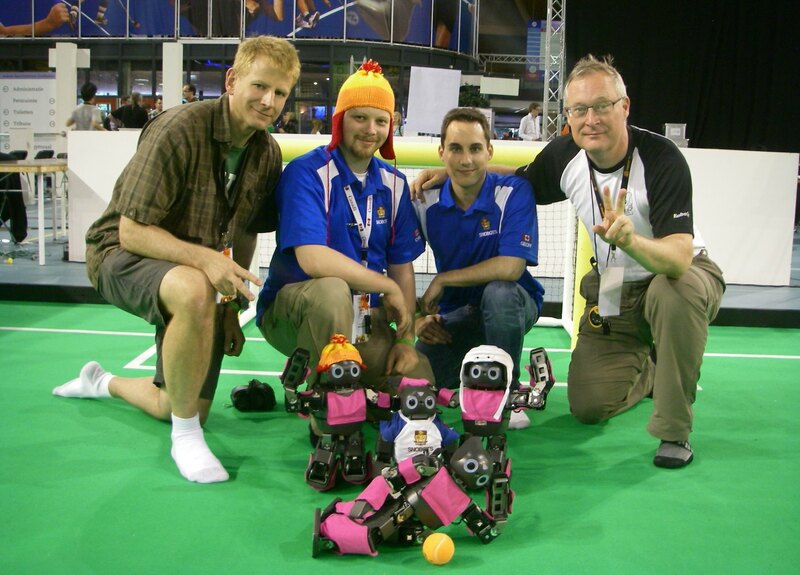 We just returned from RoboCup-2013, in Eindhoven, Netherlands, where we competed in the Humanoid League and had a paper in the RoboCup Symposium. We made it past the first round in the soccer events, and came in third in the technical challenge. As a side highlight, we also met Queen Maxima of the Netherlands. Check out more pictures in the associated Gallery - there are some competition videos available too (see the video link in the left sidebar). We're now currently preparing for the FIRA robotics competition, in Malaysia in August. We will be be attending RoboCup 2018 in Montreal, the first time RoboCup has come to Canada! The Autonomous Agents Laboratory is one of the research laboratories within the Department of Computer Science at the University of Manitoba, and is directed by Dr. John Anderson and Dr. Jacky Baltes. The goal of our work is the improvement of technology surrounding hardware and software agents as well as the development of applications employing these technologies. We are especially interested in cooperation in multi-agent settings, and the infrastructure necessary to support this and other forms of social interaction in intelligent systems.